I really like Basil Hayden bourbon and a few other Beam Suntory products so when I saw this limited edition in the store I had to try it. The Two by Two Rye is made with 5-year-old Kentucky Straight Rye, a 7-year-old “high-rye” Kentucky Straight Rye, a 13-year-old Kentucky Straight Bourbon, and a 6-year-old Kentucky Straight Bourbon and is bottled at 80 proof. Ok, that’s where the good stops. The hope with this was to offer whiskey fans both the full spiciness of rye and the sweet characteristics and finish of bourbon. As mentioned… the hope. there is a spicy burn at the end but everything else is gone. 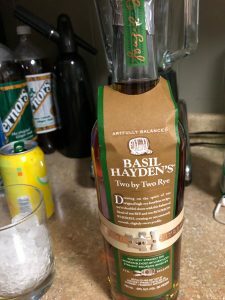 Basil Hayden’s Two by Two Rye is the perfect example of a large company that has great products goes wrong when trying to follow/catch up with smaller companies that also do a great job in different areas. Someone in the marketing department (which FYI, I am one of those people in another industry) sat around the table and said “hey, this company is killing it over here, why don’t we try to copy that and use one of our great brand names and get more market share!” The other smaller companies look to be Angel’s Envy, Whistle Pig, Litchfield Distillery and others. the problem is no one ever thinks that if it goes wrong, you can ruin the brand name. All-in-all… get a glass at the bar, don’t get the bottle. Basically, I wouldn’t waste your money. I had some hope when starting but it was never met. If you must try, try it at a bar where you are just out the drink, not the bottle price.